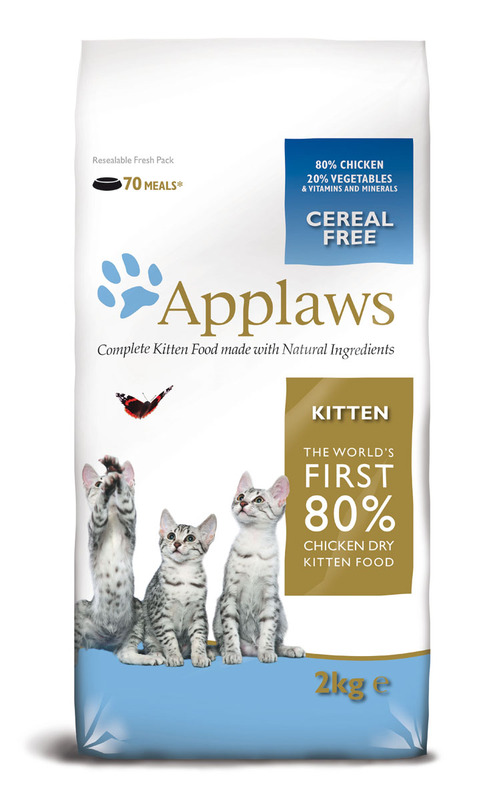 Applaws Natural Chicken Dry Kitten Food is a complete food for kittens. It can also be fed to pregnant or nursing queens. It has been specially developed to meet the different needs of kittens and queens. The simple ingredients mean that the food is naturally hypo-allergenic and suitable for sensitive kittens and will provide your kitten with the diet that nature intended. It contains a very high meat content (80% chicken) and the rest is made up of all natural vitamins from vegetables and natural extracts (20%). It is completely cereal free as Applaws does not believe in bulking out its foods with cheap fillers. It contains pre-biotics which promote digestive health and good bacteria. It only contains natural preservatives such as Vitamin E and Rosemary oil. Urinary tract health will be maintained with natural cranberry extracts. Vitamin A (retinyl acetate) 25,305 IU/kg, Vitamin D3 (cholecalciferol) 1,745 IU/kg, Vitamin E (alpha-tocopherol acetate) 558 IU/kg. Selenium from Sodium Selenite 0.13 mg/kg, Iodine from Calcium Iodate Anhydrous 1.75mg/kg, Iron from Ferrous Sulphate Monohydrate 61 mg, Copper from Cupric Sulphate Pentahydrate 9mg/kg, Manganese from Manganous Sulphate Monohydrate 26mg/kg, Zinc from Zinc Sulphate Monohydrate 140 mg/kg. Technological Additives: Tocopherol rich extracts of natural origin. There are currently no questions for Applaws Natural Chicken Dry Kitten Food - be the first to ask one!